When the subject is luxury accommodation, small inns or bed & breakfasts tend to be charming and highly personal, while big hotels offer everything a guest could want – but the places offering the best of both worlds are few and far between. For this very reason, John Hudson’s beautifully decorated pousada (inn) Vivenda has – for a few years now – been the winner of TripAdvisor’s Travellers Choice award for B&Bs and Inns in the small coastal town of Paraty, in Rio de Janeiro. A little oasis located a short walk away from the town, the place has a magical air of seclusion, privacy, and exclusivity that carries into the two pristine white bungalows and a suite inside the main house. 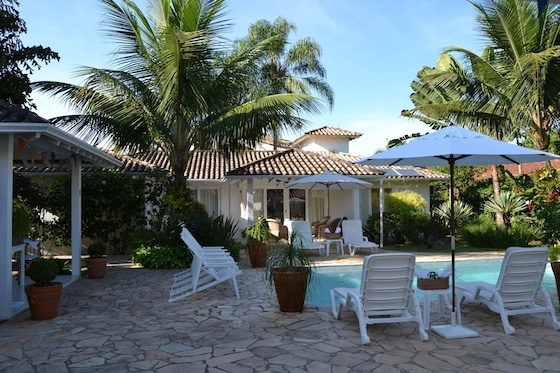 Most prominent in these self-contained homes with dining area, fully equipped kitchen and porch is the Brazilian art and craft collection on the walls and spaces, curated by Vivenda’s owner himself, who also built the entire pousada from scratch. An Englishman who came to Brazil to teach his language 26 years ago and stayed, John is always moving the decorative pieces around. He buys items that match his little hideaway in travels around Brazil, but mostly from Paraty artisans. John’s main living room and office feature eye-catching pieces by Toti, a famous artisan from the Minas Gerais village of Bichinho, as well as chickens and other animal forms from Quilombo do Campinho, a former slave community just outside the town center. The furniture at Vivenda was crafted by handpicked Brazilian manufacturers. Bedrooms also feature hand-woven wicker decorative items made by local indigenous communities. Wicker is one of the materials John likes the most: “It gives that rustic-chic feel to the place. I like to keep things simple and neutral,” he says. Some items made with shells can also be found in John’s living room. These were made back at the start of Vivenda, when he had time to spare for his own craft – nowadays, rooms at his place are highly sought after and are often booked several weeks in advance. The guest porches overlook a garden packed with orchids, bromelias and other exquisite native plants. If Paraty was not such an interesting town with so many outdoor activities, one could easily just stay at Vivenda and relax in these beautiful surroundings – even in the rare event the days aren’t packed with sun.